Blackbeard's newest flight leader has taken over from some of the greats within the Cutthroats and has quickly made the position his own. Modas initially established a presence in Crimson flight before joining BlueBeard. There he winged with Soca to become part of the deadly duo - driven by purpose, skill and teamwork. He continues to astonish us all with his skills and attitude. BTW... If he offers you a psychadelic toad to lick, politely refuse unless you like seeing flying polka-dotted sheep. Don't lend him your prized trout either. Quote: "CRUSH our enemies, SEE them driven before us, HEAR the lamentations of their women (or sheep as the case may be!)" Favorite Aircraft: "The Spit definitely wins out here. Nothing says HELLO! to a bandit like shooting them in the face with those 20mm cannons. They are about as subtle as a shotgun at a quilting bee." Yippee is a fine addition to Blackbeard flight. He brought with him a killer instinct and extensive experience in Air Warrior scenarios. Now he's tearing it up in Aces High with the misfits in the Blackbeard clan. When you only have one life to live in a scenario, only the best live to fly an entire frame. Yippee is one of those pilots. Chance joined the Cutthroats in 2002 after being promised great wealth, finely tuned aircraft, and the finest grog in the Western Hemisphere. We told him everything is in the mail. In the meantime, this killer can be seen terrorizing the skies of Aces High (and sometimes the squadron). Look for the multiple kills in the text buffer and you'll be sure to see Chance's name. Favorite Aircraft: "Anything built by Vought"
Token Soul is the Cuttroats' newest recruit turned full time killer in Aces High. He's not afraid to mix it up even when heavily outnumbered. We figure he's putting the bandits at ease before delivering that fatal shot that knocks off a wing or takes out an engine. Hardly a day goes by that Tokn isn't sweeping the skies clean of bish and knits. We also brought him in for his rumored warehouse filled with a stash of Jamaican rum. Quote: Uttered by all Cutthroats "Tokn, Check Six!" 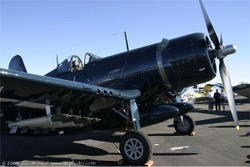 Favourite Aircraft: "Chance Vought F4U Corsair"
The pilot once known as Legba. Skilled ACE in a variety of aircraft and a rated private pilot in real life. of the most entertaining CMC's able to captivate any ready room with is off the wall humor and antics. been the very first "Alt Monkey."